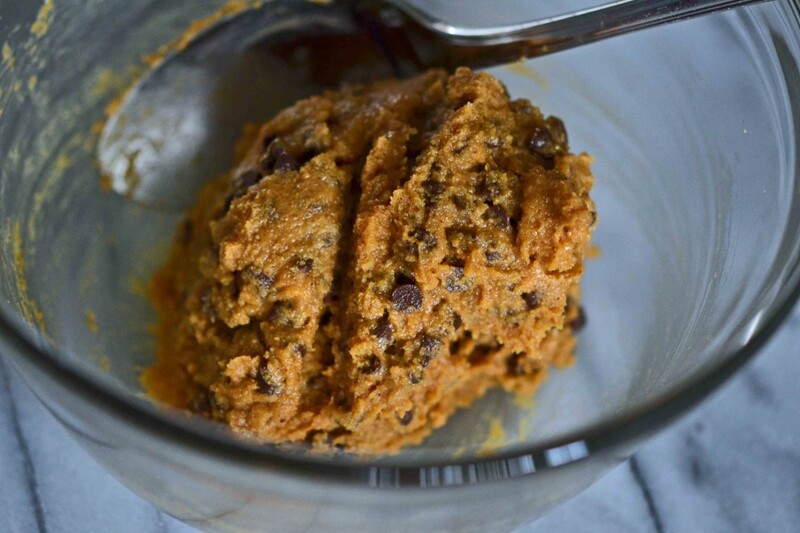 PB-Chocolate Chip Cookie Dough | Great gluten free recipes for every occasion. Every single child I have got on a bus this morning to go to school. There are only 3 of them, but they’re all I’ve got. And not only did they all get on a bus, but they all got on the same bus to go to the same school. This is the first time that has ever happened. After this school year, it won’t happen again until my oldest (now 10) is a senior in high school. My husband says it’s like a lunar eclipse. I wonder if that means I shouldn’t have looked directly into it, lest I burn my retinas. Familiarity breeds contempt. It’s true. But also true is that absence makes this mother’s heart grow fonder. And so while they are out there in the world, together without me, I figure I should have something waiting at home for them that makes them remember why they, well, came home. Food is not love. It’s just food. But it is, indeed, one of life’s great pleasures. As is the first day of school. They seemed excited, these children of mine. And they also seemed kind of nervous. And they were also all 3 wearing Converse low-tops. I want you to know that I tried, valiantly but ultimately in vain, to make a simple gluten-free-flour-based, eggless cookie dough. I tried everything. I even tried toasting the flour (don’t ask). It was memorable, but not in the way I had hoped. And even though I love the familiar taste of raw cookie dough, gluten-free or otherwise, without the egg, the trash bag, and my heart, were both quite heavy that evening. Wah-wah-wah-wah. Powdered peanut butter stands in for any sort of gluten-free flour at all in these simple brown-sugared balls of cookie dough, studded with mini chocolate chips. Cover them in melted chocolate or try them rolled tight and chilled until the moment you hear that familiar squeal of the bus brakes. With PB2’s powdered peanut butter, chocolate or plain, it’s what a peanut butter cup would taste like if it had the good sense to be cookie dough. Especially on the very first day of second, third and fifth grades. In a large bowl, place the butter, granulated sugar and light brown sugar, and mix until well-combined. 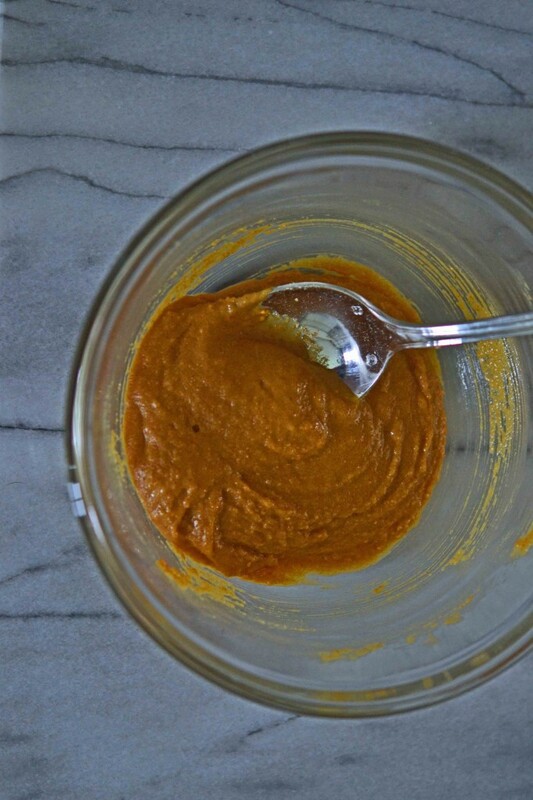 Add the salt, powdered peanut butter and vanilla, and mix until just combined. Allow the mixture to sit at room temperature for about 5 minutes until it has begun to thicken. Add the mini chocolate chips, and mix until the chips are evenly distributed throughout the cookie dough. Divide the dough into about 25 pieces, and roll each tightly into a ball. Place the balls of dough on a parchment-lined baking sheet and refrigerate until firm, about 15 minutes. I have not tried this recipe with any substitutions. Feel free to experiment! P.S. If you haven’t yet, please pick up a copy of My Cookbook. I can’t keep the blog going without your support, so thank you! Ah, Nicole, I do remember the first day my son went to school like it was yesterday…even though it was 34 years ago (he just turned 39 August 27th) and I remember thinking to myself that he was ready to go something by himself. He thought otherwise. ha ha. He was ready to greet the world and all it had to offer. I told him I would be outside waiting for him when school was over for the day. He looked at me and informed me in his most “grown-up” voice…”I’ll be riding the bus home, mom!” Needless to say, I lost it and I ended up being the one who was crying! 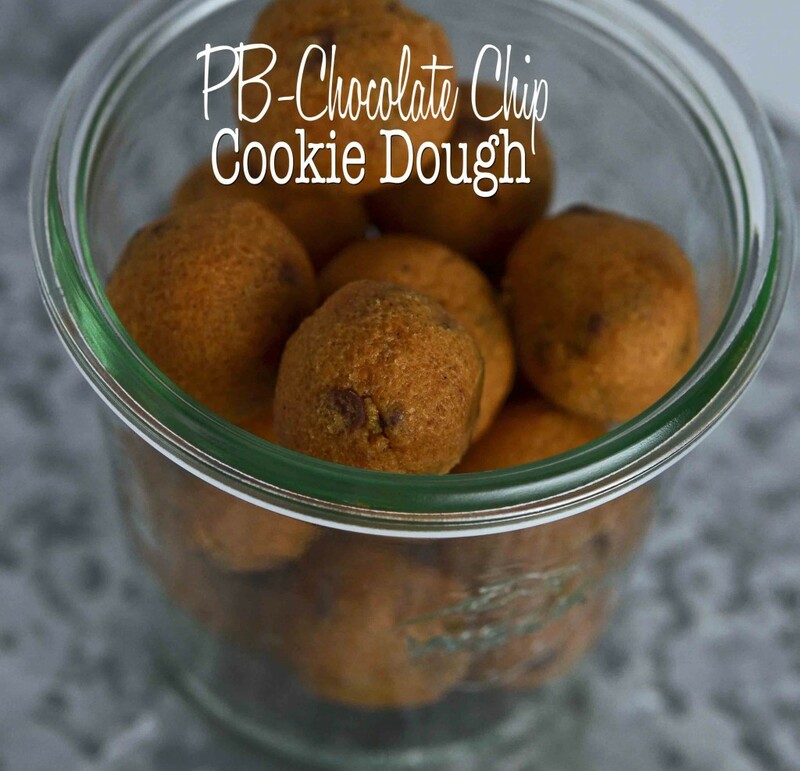 Went online and found several places in the Sacramento, CA area that sells the powered PB2 so I’ll be picking up some as I want to make this for myself and will share them with my son and granddaughter as we all love Reese’s Peanutbutter Cups!!!!! I knew what you meant, Peggy! It’s amazing how long a memory we can have for those sort of hallmarks in our children’s lives, isn’t it? The moms go home and cry into their coffee, and the kids go out into the world. I guess that’s the way it’s meant to be. That’s great that you can buy PB2 in stores near you. I just ordered a whole case of it from netrition.com, and it came out to about $4.50 a jar. Not bad. I bet you and your son and granddaughter will love these! What a shame, Marjan! PB2 is a really cool product. I wonder if there’s another website that might carry their products? Try their website (bellplantation.com). Was just wondering if you could use reg. Pb instead of the dried kind? No, mamallama, I’m afraid you definitely cannot make these with regular peanut butter. I love all butters – peanut, almond, hazelnut, cashew, but for some strange reason the only butter my daughter will eat is the kind that comes in sticks. She would eat pads of it all day if I let her. But the idea of baking something special to come home to after the first day of school is so lovely! I’m all over it. In the meantime, I’ll be on the lookout for powdered peanut butter (um, did you say it comes in chocolate? Be still my heart) for myself. Thanks Nicole! Yes, just real butter, the um, unhealthy kind :) Baking your cereal breakfast cookies now ! alas, no nuts for my picky girl just mini chips. Can’t wait to try them. The awesome oatmeal squares that I “hid” in the freezer are nearly gone and school starts in less than a week, eeks! You can’t make this recipe successfully with any of the major substitutions you have asked about, I’m afraid. I think you’ll have to skip this one! But, it arrived on Saturday and I couldn’t be more happy! You now have a permanent place in my kitchen and I can’t wait to try some more of your recipes! That was basically a long winded way of saying thanks for being amazing!! Our two sons are grown and have very young families of their own but the first day of each school year sending them off to school has burned themselves into my brain. I can totally relate to your experience. And yes as a full time mom I always had some homemade treat ready for them “just in case”. Some of our best moments were over warm cookies and milk before they went off to football practice or just outside to play when they were younger. Those times are like movies that replay in my mind while they create new movies with their own families. To all Moms everywhere Enjoy the peace and quiet while they are out of the house but above all cherish their chatter when they come home and LISTEN to what they don’t say. As my oldest said to me one day “It’s coming home, Mom and yelling HI and you saying Hi back and giving me a hug” means everything to me. So from a newish Grandma to all Moms out there enjoy and Nicole I treasure your blog and recipes they are fantastic, economical and above all delicious! PS Where do I find powered peanut butter? There is a link above to Bell Plantation website from another reader. That apparently will tell you where you can buy PB2 in stores. I have ordered from amazon, and just ordered a case of 12 from netrition.com, since they had the best price for that sort of stock. My kids really love it – and I am loving baking with it. Did you get the powdered peanut butter on amazon? Any stores carry it? Thanks for the recipe! Yes! I got it on amazon. I also just ordered a case of 12 jars of it from a site called netrition, since they had a better price than amazon (and flat shipping on that item). I haven’t seen it in stores, but I bet some health stores (maybe Whole Foods?) carry or will carry it. This is close to being my most favorite day of the year! My kids find me a bit boring, and they thrive on routine, so school is the best place for them. Well, jail has routine, so that might work, too, but I bet that is almost as boring as mom! I have big plans for your recipes this year, waiting on my rice bran delivery from Amazon to get going on some breakfast cookies and bars. Yay!! I sent one off to school walking this morning, one on a bus, and two on bikes. Since three of them are going to the same campus, you can guess that there are some complications in our tranportation here, which will only get worse when it starts snowing — hopefully that won’t be too soon, but it is MN, so who knows? Enjoy your loud quiet, in just a few short hours, it will be loud loud again! I love you, too, Nicole! Yummy!!! Looks wonderful! I can totally relate to seeing them all go off. Last year was the one year all 3 of my boys were in the same school together. Had one in K, 2, and 4th. It was incredible to think for us that was the only time!! This morning the all got on the same bus with my oldest started middle school and the younger 2 headed to elementary school! I raced home start work on my Better Batter yellow cake which I will be turning into a calculator. Make a cake every yr that is school themed. On a side note…bought a bunch of those USA pans yesterday..made the cake and your blueberry muffins in them and they turned out great! Thanks! I’ve never, in my wildest dreams, even imagined that powdered peanut butter existed. I’m completely fascinated. Same here. Homeschooling is great ;). My 10 siblings and I have never stepped foot in a public school. Amazing recipe. Amazing that I actually have all 7 ingredients on hand. Really, amazing. But, what kind of chocolate did you dip them in? 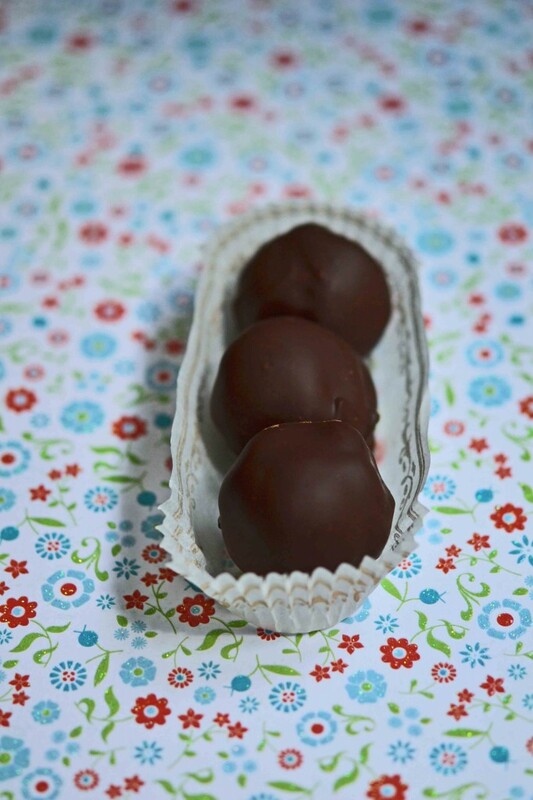 Cookie dough is awesome, but chocolate covered cookie dough is well, amazing! You are ingenious!! 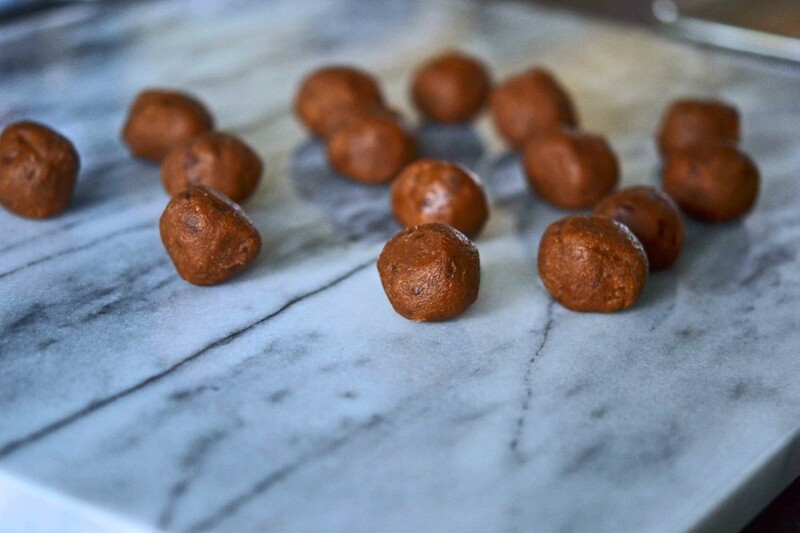 Powdered peanut butter…….great idea! When youngest went to kindergarten, hubby called and asked how I was doing. I had quit smoking 12 years prior. I said, “I would kill for a cigarette right now.” I didn’t get one though. The first day was the toughest. Hang in there Nicole. I am sure you will use the energy towards more great recipes. I will be here to cheer you on! Thank you so much for the kind note, Patti! It’s funny about the first day of school – I look forward to it all summer, to be honest, since 10 weeks is a loooooong time to be together, but then the first day comes, and it’s just me and the dogs. And the quiet I longed for is, well, loud. You know? I think you do know. ;) Glad you didn’t smoke that cigarette.